If sanding discs are essential for your industrial operations in Kansas City, Wichita, Dallas, Fort Worth, or another city in the Midwest and you need a reliable distributor you can trust to get you those products when you need them, then you should turn to Wm. F. Hurst Co., LLC. We have served businesses in the Midwest since 1962, and our longevity as an industrial supply distributor shows that companies have continually relied on us to provide them with the products they need to keep their operations running smoothly. 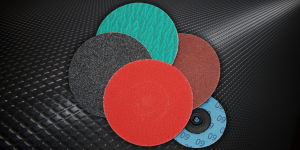 We offer bonded, coated, and non-woven abrasives from several industry-leading manufacturers, and have multiple aluminum oxide sanding discs among our selection. We also offer an unmatched selection of other industrial supplies, including material removal tools, assembly tools, and power feed drilling equipment. So, whether you need a right angle drill, torque tool, vertical grinder, or another power tool, we’re confident you will be able to find what you need among the products in our comprehensive selection. To receive more information about our selection of sanding discs and other industrial supplies, please contact Wm. F. Hurst Co. today. We proudly serve industrial operations in Kansas City, Wichita, Dallas, Fort Worth, Joplin, Springfield, and many other cities in the Midwest.